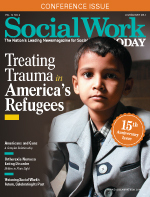 With this issue, Social Work Today celebrates its 15th anniversary. In honor of the occasion, we asked our editorial advisors to compose essays reflecting on the nature of the social work profession. We asked them to look to the challenges social work may face in the future and project how the profession may tackle these challenges based on how it has faced obstacles in the past and how it is facing them today. The essays are opinionated, some controversial, but all are thought provoking from social workers who have years of experience and knowledge of this noble, compassionate, and activist profession. We thank our readers for their loyalty to our publication through the years and more importantly, for the important work they do with individuals, families, and communities. You are the unsung heroes in so many places of practice, and we recognize and honor your hard work and professional commitment. To paraphrase a sentiment often attributed to Mark Twain, "History doesn't repeat itself but it rhymes." Twain's time, which he dubbed the Gilded Age, was an era in which vast fortunes were held in the hands of a few while multitudes worked long hours for low pay. Nativist anger and anxieties led to the vilification of immigrants and other targeted groups. The media was controlled by powerbrokers whose "yellow press" played on emotions and stereotypes. Politicians soaked up money from big business, parlayed fear and social division into votes, and aligned their interests with those of great wealth in the belief that as the profits rolled in they would somehow "trickle down." Rather than address underlying injustices and pervasive racial, gender, and economic oppression, the standard tactic among those who benefited from this arrangement was to blame those who suffered for their lack of industry or moral character. It was during this time that the modern social work profession was born as activists, visionaries, and what historian Christopher Lasch has called "new radicals" like Jane Addams raised their voices in protest. Though our founders often focused on direct service, they understood that the larger cultural context and decisions made by those in power had a role in creating and perpetuating the problems and injustices they were trying to solve. The action and ethical vision of these early social workers became an energetic force in larger "Progressive Era" political reforms, which introduced a new, albeit tenuous, ethic of social justice into conceptions of government's responsibility to the common good of its citizens. Though progress has been made in the last century when it comes to strengthening this larger commitment to social justice, the parallels between this time and our own are many. Twain was right; history does rhyme. It's becoming difficult to rationalize politically driven cuts in social programs and reimbursement when decisions are made that financially favor large campaign donors, political action committees, and corporate lobbies. Are lavish tax breaks for multinational corporations really more important than raising the minimum wage? Is another $100 million for the latest military weaponry really more important than ensuring children no longer go hungry? When is it unethical for social workers to quietly accept cuts in funding that adversely affect those who are suffering? And what about social workers employed by large profit-driven organizations? At what point does the drive for profit become so excessive that it jeopardizes the care these organizations purport to provide (by denying needed staff and other resources in order to maximize profit)? How do we work within such a system? At what point does accommodating this system become complicity? More social workers are coming to the conclusion that the values that have come to define our political and economic culture are in conflict with those of our profession. In such situations, the current NASW Code of Ethics affirms our historical roots and urges us to become agents of reform: "Social workers pursue social change, particularly with and on behalf of vulnerable and oppressed individuals and groups of people." On an organizational level, this may mean starting an initiative dedicated to diversity, inclusion, or reaching underserved populations. It may mean picking up protest signs and joining crowds (like those routinely gathering near the Governor's Mansion in my state to declaim policies seen as punitive to the disadvantaged and intended to disenfranchise people of color). It may mean joining an advocacy group working to reduce gun violence or increase access to education. It may mean writing letters to the editor or an op-ed piece, starting a blog, or making a relevant posting on Facebook. With the proliferation of podcasts, local radio, and YouTube, social workers have never been in a better position to comment and advocate in ways which reach great numbers of people (think, for example, about the TED Talks of Brené Brown, Phd, LMSW). With dicey issues abounding in the national discourse on everything from police violence and mass shootings to how to "fix" health care and what to do with our burgeoning prisons, social workers have an opportunity to push for reform in ways in which Addams never dreamed. Across the nation, social workers are engaged in municipal, state, and federal politics, and others are being heard in meetings from city councils to congressional hearings. Some are working to change unfair laws; others are choosing to go to jail in acts of civil disobedience. Our advocacy and courage is as needed today as it was during the Gilded Age. We need only read the opening words of the preamble to the NASW Code to steel our resolve: "The primary mission of the social work profession is to enhance human well-being and help meet the basic human needs of all people, with particular attention to the needs and empowerment of people who are vulnerable, oppressed, and living in poverty." It seems the last two years are forming the future of the profession in lightning fashion. There's some good news—the resurgence of macro emphasis. Remediating social injustice is what makes our profession unique. Along with cultural competency, it is what sets us apart from other helping professions. Only our Code of Ethics exhorts practitioners to "promote the general welfare of society, from local to global levels, and the development of people, their communities, and their environments" (NASW). Individual practice is informed by the contexts in which people live, thus calling to mind the umbrella of social justice. Social workers were admonished in the early 1990s as "unfaithful angels" (Specht & Courtney, 1994) who had abandoned their mission. The call stung but largely went unheralded. Radical social work authors admonished the profession to revisit Saul Alinsky's Rules for Radicals (Pelton, 2001; Reisch & Andrews, 2002) and rang the bell yet again for social work educators. A decade later, the literature was still questioning whether social justice was alive and well in social work practice (O'Brien, 2010). And most recently, the call has been for social work education to bring back the "social" of social work by reviving our profession's commitment to promoting social justice (Kwong Kam, 2014). The tendency for social workers to find a valued, lucrative niche in clinical work can't be ignored. It reflects the trajectory of a profession trying to legitimize itself but, unfortunately, polarizing professionalism and social activism. There is a complementary relationship between "case" and "cause." Social work education cannot just give lip service to the organizing framework of social justice. Increasing attention to social justice is evident both in curriculum and practice. Curricula that reflect social justice have emerged in both required and elective courses. The Council on Social Work Education's Learning Academy for Teaching Social Justice currently has a call for papers regarding social justice in social work education. Social workers are increasingly involved in blogging and organizing around current events such as Black Lives Matter and environmental justice atrocities such as the lead water poisoning in Flint, MI. Historically, there has been an imbalance in social work education between micro and macro perspectives. The preferred understanding is that our profession not reflect a competition between micro and macro. When a person seeks help from a clinician with adjusting to a cancer diagnosis yet does not have access to adequate health care, we see the situation as addressing both micro and macro issues. If we help a woman extricate herself from interpersonal violence, understanding that her situation represents a societal oppression of women sanctioned by a patriarchal system, we are not myopic clinicians neglecting social justice. A clinical social worker does not necessarily betray her roots; no more than a community organizer denies that victims of oppression still need the corrective emotional experience of relational counseling. Exploring social injustice causes and consequences, by not creating a false dichotomy of micro/macro practice, but emphasizing social justice at all levels, is the ideal voice in social work education. — Claudia J. Dewane, LCSW, DEd, is an associate professor in the school of social work at Temple University and founder of Clinical Support Associates, providing supervision, consultation, and training to professional social workers. Kwong Kam, P. (2014). Back to the 'social' of social work: Reviving the social work profession's contribution to the promotion of social justice. International Social Work, 57(6), 723-740. O'Brien, M. (2010). Social justice: Alive and well (partly) in social work practice? Retrieved from http://isw.sagepub.com/content/54/2/174.abstract. Pelton, L. H. (2001). Social justice and social work. Journal of Social Work Education, 37(3), 433-439. Reisch, M., & Andrews, J. (2002). The road not taken: A history of radical social work in the United States. Philadelphia: Brunner-Routledge. Specht, H., & Courtney, M. E. (1994). Unfaithful angels: How social work has abandoned its mission. New York; Toronto; Free Press. Recently I thumbed through my yellowed, jagged-edged copy of Mary Ellen Richmond's classic book What Is Social Case Work? An Introductory Description. Richmond, one of social work's most influential lodestars, wrote this book in 1922 when she was director of the Charity Organization Department at the Russell Sage Foundation. Prior to this post, Richmond worked at the Baltimore Charity Organization Society and Philadelphia Society for Organizing Charity, where she helped lay the foundation for the relatively new and emerging social work profession. Richmond's pioneering work and spirit focused on the needs of America's most vulnerable citizens. Although no one used the terminology in those days, Richmond's writings were saturated with what today we call the strengths perspective. Richmond was determined to focus on people's strengths instead of treating them as morally bankrupt or bad, which is the way many of her early-20th-century compatriots regarded people who were poor, unemployed, and suffering. Fast forward. In some important respects, not much has changed. Today's social workers often lament the pushback they experience when some members of our society shout epithets at refugees in the United States who fled religious and political persecution in their homelands, peaceful Muslim citizens who want nothing more than to quiet and eliminate terrorism, and LGBT people who advocate for equal rights. The social and political issues have changed somewhat since Richmond's era, but the persistent, sometimes ugly, societal tensions have not. When Richmond helped shape the fledgling social work profession, there was no national code of ethics around which practitioners could rally. Indeed, Richmond is credited with inaugural efforts in the 1920s to develop an experimental draft of the code. It was not until 1947 that the American Association of Social Workers, the largest organization of social workers at the time, adopted a formal code. In 1960, five years after its creation, NASW adopted its first code, a one-page document that included 14 brief proclamations. Interestingly, this first NASW Code of Ethics emerged at the front end of the turbulent civil rights period in the United States. At that time, no one could have forecast the cataclysmic social change that would occur during the next decade and beyond, especially related to transformations in the rights of racial and ethnic minorities, women, public assistance recipients, patients, and prisoners, among others. These widespread social challenges forced social workers to take a hard look at the principal purposes of the profession, especially with regard to meeting the clinical needs of vulnerable people and, as well, addressing the broader structural problems in society that led to and exacerbated poverty, unemployment, homelessness, poor health, crime, discrimination, and other significant social challenges. One of the remarkable byproducts of social work's ongoing efforts to define itself was the path-breaking emergence of a new, comprehensive code of ethics, adopted in 1996. For the very first time in social work's storied history, the code included an explicit mission statement that proclaims that the primary mission of the social work profession is to enhance human well-being and help meet the basic human needs of all people, with particular attention to the needs and empowerment of people who are vulnerable, oppressed, and living in poverty. Fundamental to social work is attention to the environmental forces that create, contribute to, and address problems in living. Social workers promote social justice and social change with and on behalf of clients. For me, this is a remarkable statement that social workers should not take for granted as we contemplate the profession's future. True, social workers have always highlighted the profession's concern about broad social problems and social justice issues, in addition to the needs of individuals and families. But, it is this set of words that codified for the first time social work's earnest preoccupation with the very special "needs and empowerment of people who are vulnerable, oppressed, and living in poverty." These are the words that define me as a social worker and give meaning to my professional purpose. And my deep hope is that these words will honor Richmond's rich legacy and inspire the next generation of social workers who are likely to tackle social problems that, today, may be unimaginable. — Frederic G. Reamer, PhD, is a professor in the graduate program of the School of Social Work at Rhode Island College. He chaired the national task force that wrote the current NASW Code of Ethics. Read any magazine or newspaper, watch any media news, review any recent studies on social indicators—all will attest to the fact that there are social, political, and economic factors facing people in American society today that are hostile. Income disparities are at an all-time high; homelessness is increasing; food insecurity and hunger are revealed; crises in child welfare, due in large part to substance abuse, are reported nationally; and underemployment is rampant. Candidates for the presidency encourage discrimination against "others," particularly immigrants. Racism is apparent in communities throughout the country, and law enforcement policies and practices are investigated for underlying racism. Governments knowingly expose residents to lead-contaminated drinking water, and pass legislation that overtly discriminates against LGBT people. Veterans are denied or delayed in receiving necessary medical and social support services. This is the context in which today's professional social workers seek to enhance human well-being; to empower people who are vulnerable, oppressed, and poor; and to change environmental forces to achieve increasing social justice. Within this disheartening context, more than 600,000 social workers fight daily to fulfill their professional obligations to individuals, groups, and communities. And fight they must. Budget cuts in social welfare agencies, both public and nonprofit alike, have constrained social work services, enlarged caseloads, and reduced available support services for clients. Funding for social work services has become dependent on external reimbursement—if there is no external reimbursement through insurance, there may be no services provided. For-profit agencies may constrain social work professionals, as conflicting goals apply to service provision. It is appropriate that the profession has highlighted its position as the profession of hope, as hopelessness looms large in today's environmental context. Did the social workers of old view their social, political, and economic context as so hostile? It is tempting to think this is the "worst ever" environment to achieve the profession's goals of enhancing human well-being and advancing social justice. Yet, as one considers the history of the profession, it is clear that hostile environmental conditions faced many, if not most, of social work's pioneers. Those who fought for human rights, for the poor, for immigrants, for children, for older adults, for women, for people with disabilities, for LGBT people, and for many other devalued and oppressed populations, faced an environment hostile to social work's goals and purposes. Yet, social change was achieved, and progress towards social justice was made with, and for, these populations. Whether or not today's environmental context is more or less hostile than those faced by our professional forerunners, it is clear that change can be made. There is always hope to propel these changes. Future social workers can envision many exciting and innovative possibilities to achieve the profession's goals of enhancing human well-being and advancing social justice for devalued populations. The profession's leadership has determined a path for the future of social work in the "12 Grand Challenges for Social Work." A Special Commission to Advance Macro Practice in Social Work has been established. Obstacles will always exist, but creating micro practitioners who are knowledgeable about and involved in macro practice is an imperative. As suggested in many policy textbooks, macro practice influences, and often determines, micro practice. Micro practitioners experience this on a daily basis—who gets served, the services provided, the length of time allowed for service, and the goals of service are routinely defined by policy, not practitioners. The insights and experience of micro practitioners form the framework for advocacy and social change goals that macro practitioners address. Mechanisms to connect micro practitioners to their macro counterparts are necessary, including support from social welfare agencies. Research, often not embraced by micro practitioners, offers an opportunity to experiment with new and creative interventions for different populations. Animal-assisted therapy, music therapy, art therapy, and other interventions are being scientifically evaluated for effectiveness and may become evidence-based approaches in the near future. Micro practitioners' creativity can be pursued and simultaneously assessed for effectiveness. Such opportunities may excite practitioners' participation in research. Technology will be a necessary component of social work practice in the future. Beyond the ability to use agency software, social workers of the future will need to use technology to accompany and extend interventions, to link clients with useful support resources, to serve more clients effectively, and to participate in research accompanying practice. Macro practitioners will use technology for advocacy, fundraising, organizing, publicizing research findings, and conducting research. Social workers who can design software appropriate to the profession's purposes and goals, within agencies, and within the larger environment, will be needed. Clearly, new roles for social workers with technological expertise will emerge. The profession of social work will change as the environmental context changes over time. The tools available to social workers have changed and will continue to change. The purposes and values of the profession will guide these changes. These purposes and values have anchored the profession for more than 115 years, and will continue to serve as necessary components of American society. There is always hope—hope for a future in which all people are respected, treated fairly, assisted in achieving life goals, and valued as human beings. Social workers of the past have transformed hope into tangible progress and future social workers will do the same. — Lynne Soine, DSW, LMSW, is a professor emeritus in the social work department at Plattsburgh State University of New York.